In reflection the bus journey was far more memorable than the cycling. On a November morning eleven years ago I travelled on what must surely have been the oldest bus pulling out of Dar es Salaam that day. 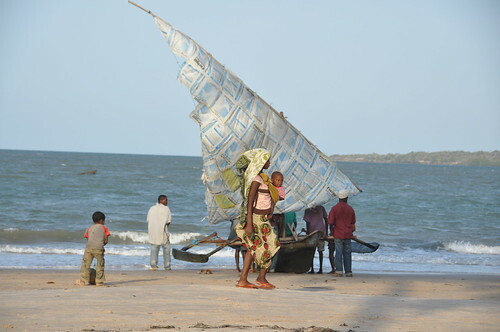 The journey to Kilwa Masoko, some 350km to the south, took 2 days. The bus was in a far worse condition than the road, which was also a mess. That age-old vehicle broke down continually, got stuck in mud and required the passengers to push it out, and when it arrived half-way at the Rufiji river the chain-ferry had stopped service for the day. Passengers slept on the bus. I opted for the roof and got mauled by mosquitoes before the rain came down. In the daytime the roof was in fact the best place to sit. 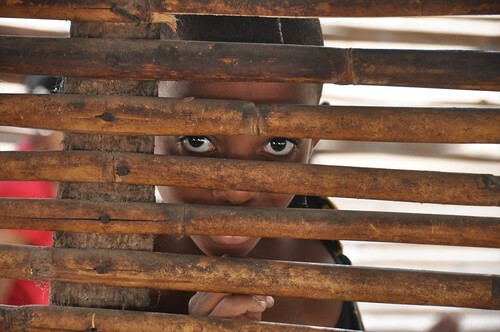 The sound of screaming babies below was only just audible and there was no smell – that gut-wrenching infusion of bodies sweating, livestock defecation and sacks of dried fish baking in the heat. I think the memory remains vivid because it was my first ‘real’ African bus journey. Now buses make the journey to Kilwa in about 6 hours. There is a bridge over the Rufiji and the road is mostly paved. It took me four days to cycle it. I had planned on three but the heat and humidity defeated me. 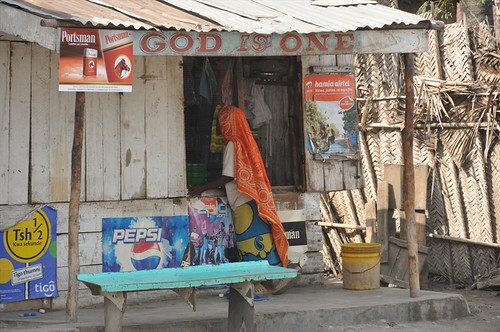 At the end of my first day out of Dar I counted drinking 9 litres of water on the road and a further 2 in the evening. All there was to show for it was a lame dribble before falling asleep in a fan-less room, that for 3000tsh (£1.20) is about as cheap as accommodation gets in Africa. For the most part the landscape was dull. One might call it a coastal road, but the Ocean was always out of sight and there were no real climbs to get a good vantage point of the surroundings. The bush was often burnt to a dust-coloured brown by the sun. In many places it had actually been set alight and burnt, leaving it black and lifeless. This burning is done to regenerate growth of new grass (I think?) when the short rains come in November. There never seems to be any control. Flames race towards the road in the wind and the sky rains down with ash. It is a practice done in much of Africa. The rainy season is always a more scenic time to be cycling Africa, despite the frustration and intrusion it can make to a day on the road. Not all the landscape was parched dry. Mango and cashew trees provided some colour. The former are laden with fruit and in several weeks time roadsides in Tanzania will be lined with stacks of them. Outside of the towns they will sell for 50 or 100 shillings (£0.04) in the height of the season and taste immeasurably better than what one might pay £2.00 or more for in a supermarket back home. Occasionally in Africa I have told people what the Pineapple, Mango, Papaya or whatever tropical fruit it is I am buying on the roadside for a matter of pence would cost me back home, but this often seems to reinforce the chasm between my life and fortune and the people I’m buying from. 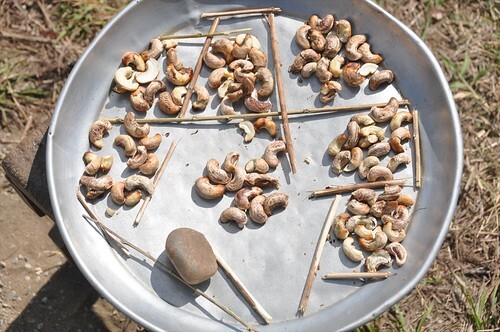 A handful of cashew nuts, depending on quality, will also sell for anything between 100-500 shillings (£0.04-£0.20). Unlike mangoes they don’t just drop of the trees. One cashew nut grows from one cashew fruit and must be roasted in its shell before being carefully tapped to release the nut. I watched and helped with the process in The Gambia last year. Most cashew nuts are exported to India from here for processing. 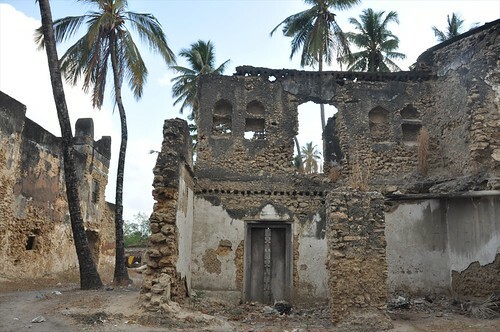 The east African coast is dotted with the ruins of forts and trading posts, which at one time saw the export of slaves, ivory and gold from its shores in exchange for textiles, jewellery and spices from Asia. 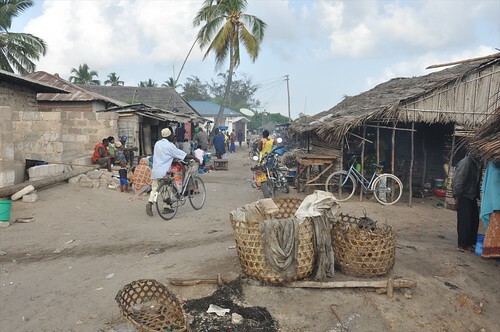 In the 12th Century the small island of Kilwa Kisiwani was the largest city on the east African coast. Now it is a UNESCO World Heritage site. I visited the first time I was here and decided I’d seen enough ruins in the past few months to warrant a return trip. 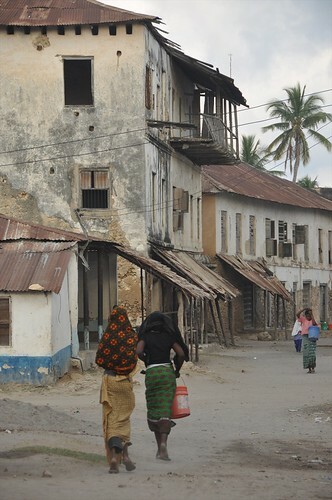 Neighbouring Kilwa Kivinjie was equally as interesting. This was also an Arabic and later German administrative centre. What remains is a familiar display of crumbling coral-brick buildings that locals treat more like a rubbish dump. 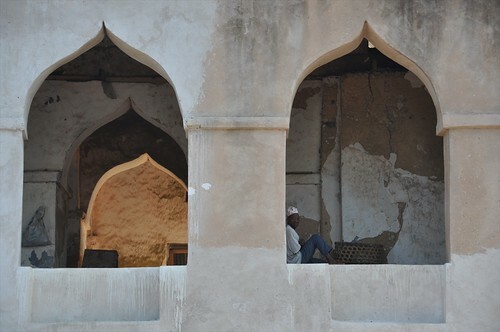 Preservation of historical buildings comes a long way down the list of priorities for most African people. In fact it isn’t a priority at all. 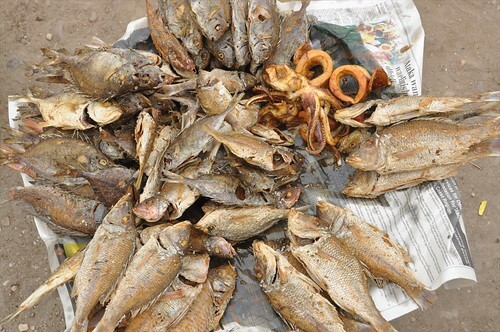 Fishing dominates here. 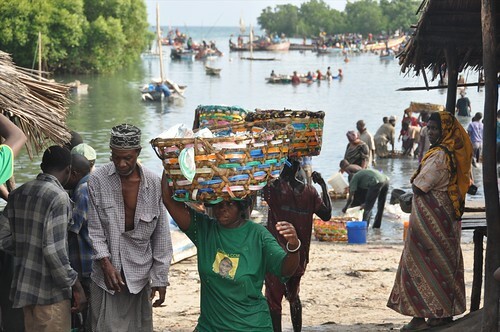 Hundreds of small wooden craft make their way out through the mangrove-shallows each day to return with what is a life-line for the majority of people here, and elsewhere along the coast. 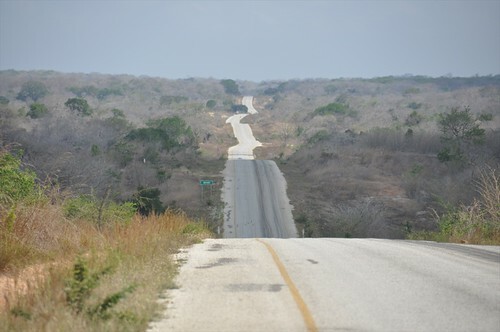 South from Kilwa the sea disappears from view for another 170km until one approaches the town of Lindi. Other than a few new banks and the ubiquitous Chinese motorbikes little has changed from when I was here last. I met two Slovenians on the way in and two French on the way out. Both were travelling on two-wheels, the former on a motorbike and the latter on bicycles. I stopped to chat with both, the cyclists naturally for longer. Jeremie and Claire have been on the road in Africa for just over a year, although the appearance of their bikes, the loads they were carrying and the sun-faded panniers made me think longer. Both were carrying Accordions and a didgeridoo (I don’t think they make light-weight versions for cyclists) – making music and recording sounds through Africa. We ate chapattis, rice and beans and washed it down with numerous cups of tea in a small mud-brick café at the roadside. Encounters like this are often the most enjoyable on the road, but they happen too rarely and you usually say goodbye too soon seeming as you’re travelling the opposite way. 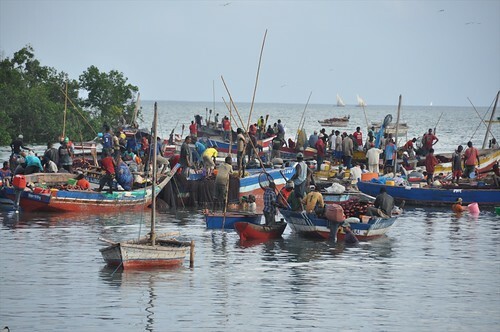 I told them to look out for Hiromu, who is also heading south from Dar shortly. 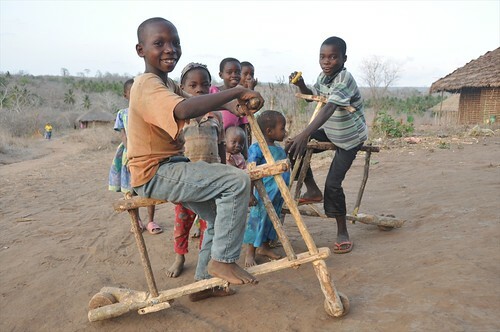 I assumed they had come from northern Mozambique, but had instead taken the road through southern Tanzania that connects with Lake Malawi. I travelled this way on very slow buses before, and don’t remember it to be as scenic as they said. 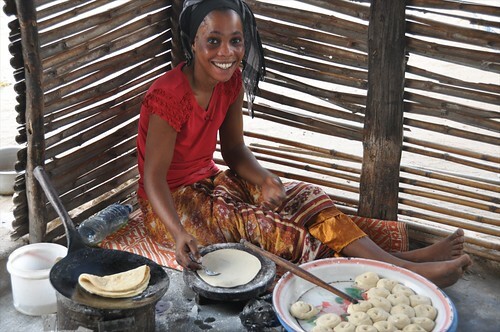 Northern Mozambique, like the region of Tanzania they were coming from, is seldom visited by foreigners. 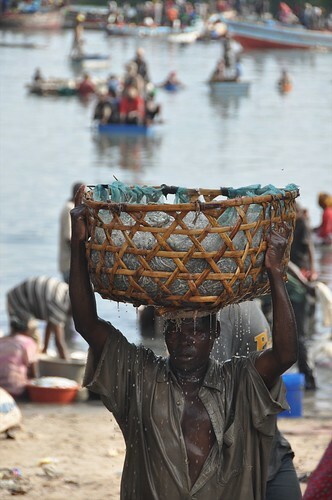 I will be entering in the next day or two, the first border crossing over a river since I left CAR for the DRC. I’m not quite sure I’ll encounter the same level of adventure there as I did in the Congo, but a return to Portuguese-speaking Africa will make an interesting change. Having the possibility of cycling through Mozambique next year, I’m really looking forward to your up-and-coming leg of your journey. I’ll be interested in any observations and reflections you have, particularly as you seem to take the road less travelled and prefer dirt tracks and small villages. The very best of luck. On a more profane note, I’m also thinking of fitting a Hebie chain guard like yours to my own Thorn Rohloff bike. Talking to Thorn about this they are generally negative and seem to think that it doesn’t really fit their bikes. However, knowing that you have fitted one, I’d be very interested to know how it is faring after all these thousands of miles. Could you give some feedback on that. Do you still think that it is prolonging the life of your drive system? (I know that to fit one, I’ll have to change my chainring to a slimmer model). Hi, My hebie chainguard is an excellent addition to the bike. I would highly recommend one, but as you mention you will need to fit a slimmer chainring, such as the Surly. SJS cycles are full of information that I’m not always sure is based on very much trial and testing of kit. They want everyone to buy their own handlebars and steer people clear of butterfly bars for example, which I’m a fan of. First Mozambique post just coming. the bus ride sounds fun…especially if you were on the roof..better the mosquitoes feasting on you than the commotion inside I guess. 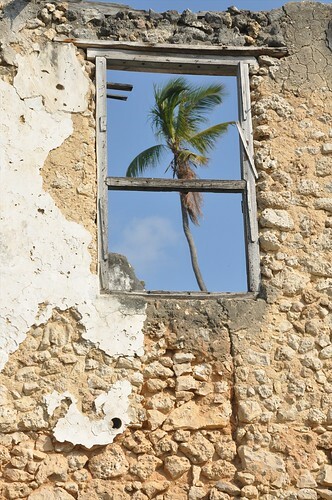 love the pictures….amazing how much ruins of old buildings can tell. Thanks – you should take a bus trip down to Tanzania perhaps, without the livestock onboard!